We never knew how old Nola was - she was a rescue kitty, full grown when we took her in. I had her for 13 years, and on her first vet visit, they guessed she was about two. 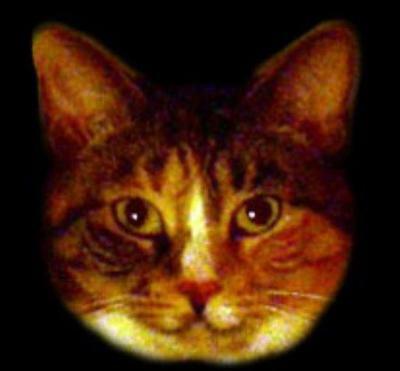 She passed last Friday, Jan. 29, 2016, almost exactly 1 1/2 years - right down to the time of day - after my partner, William, of 31 years passed. Nola was probably the least intelligent cat I ever had, but she was by far the most affectionate. She absolutely had to be on my lap, she slept with her head on my chest, and if I left the room for more than a couple of minutes, she would come to see what I was doing. She was such good company. Nola looked like a cute cat. I'm so sorry for her loss. She brought you both so much happiness. RIP Nola. 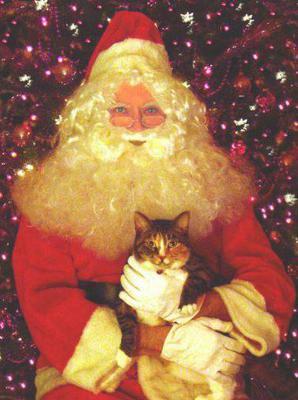 Not many cats get held by Santa Claus. Nola was one lucky cat.